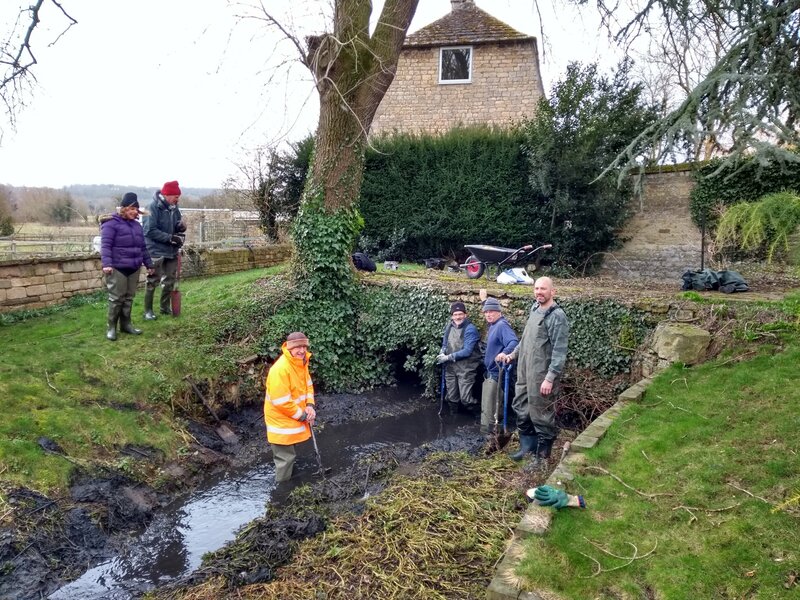 On Saturday 17th March, we joined members of the St. Peters Community Group in removing silt and debris from the historic Millstream flowing through Stamford Town. The Stamford Millstream is an historic site of significant importance to the community of Stamford Town and its visitors. Mentioned in the Domesday Book, today’s millstream channel was cut around 1640. From a weir a mile above the town, it fed King’s Mill, now an attractive stone building forming the backdrop to the Town Meadow. The Millstream flows alongside the Town Meadow to re-join the River Welland by the Town Bridge. Over its entire length the Millstream used to be frequently visited by residents and tourists, but is currently overgrown and stagnant. Work in the 1970s to abstract water to Rutland Water, cut the Millstream off from the River Welland. In addition, the millstream was removed from the care of the Environment Agency; its management is now down to the landowners of its banks. A water pump and culvert was built by Anglian Water in 1975 to sustain the Millstream’s flow. However, despite great efforts by several local charities/volunteer groups (e.g. Stamford RiverCare and the Welland Rivers Trust) and businesses (e.g. Cummins Generators), over the years the Millstream has become overgrown. While Anglian Water maintain the pump and culvert to the Millstream, the stream is unable to flow because of backup caused by debris in the stream, and it is blocked in several places. While large numbers of dog walkers and tourists still visit the Meadows and walk along the Millstream, the stagnant water now provides little amenity or biodiversity value to the town and action is needed to make the stream more attractive and valuable to the Town and to wildlife.